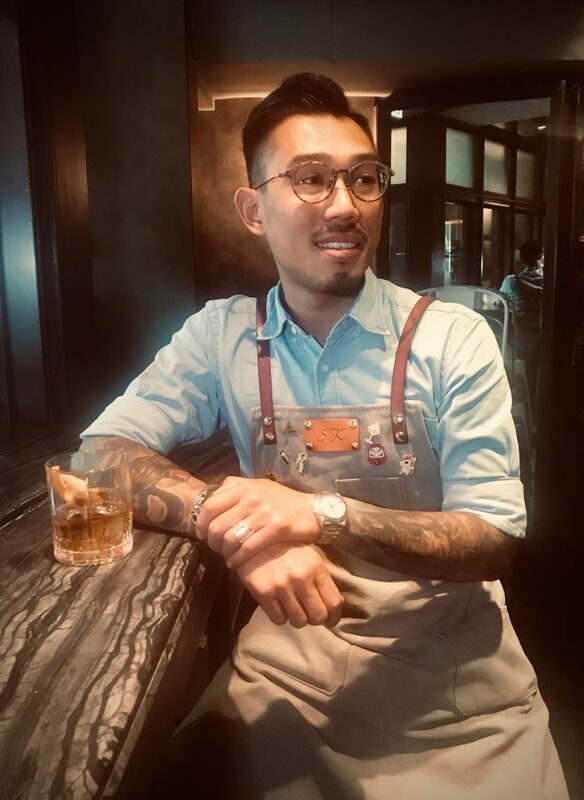 My name is Samuel Kwok, I started bartending when I was 19 and I’ve been a bartender for the last 13 years. When I started in the industry, people were just drinking alcohol to get drunk, so the role was more about social skills than technique. When cocktails became more popular, I saw that there was a real opportunity in the industry. You can make people happy, but at the same time you can be admired you for what you create and craft. Cocktails are just like dishes in a restaurant, you are a liquid chef. People should be able to feel different layers, textures and flavours in a drink. The difference is that in a restaurant you have different dishes where you can impress a client (entree, main, dessert), but with a cocktail you have one chance and then they’ll decide if they’d like to try more. This means you have to work hard not only on the taste, but also on the presentation and garnish. I joined Quinary more than 5 years ago and we work very hard on all these areas which I find really rewarding. My dream bar would be a speakeasy with 30-40 seats hidden behind a tattoo shop. The cocktails would be classics and I’d also serve small cold dishes to nibble. The interior design would feature a lot of wood and leather with animal heads on the walls and the music played in the bar would be classical. I do exercise before work and I don’t tend to go out a lot. I like American whiskey, like bourbon or rye. With bourbon you have the fruitiness, which you can push in a cocktail. My preferred brand is Michter’s and I love to use it in a boulevardier, which is my favourite cocktail. I think a good cocktail is about balance, but even more important is dilution. Even one or two seconds difference can really change the flavour and quality of a cocktail. I enjoy using Fernet Branca. It’s fun to use and I like the bitterness. You need to go and meet my mentor, Marian Beke at Gibson Bar. In Moscow check out Mitzvabar, a Jewish concept bar, where their focus is on precision and details like a classic Japanese bar.